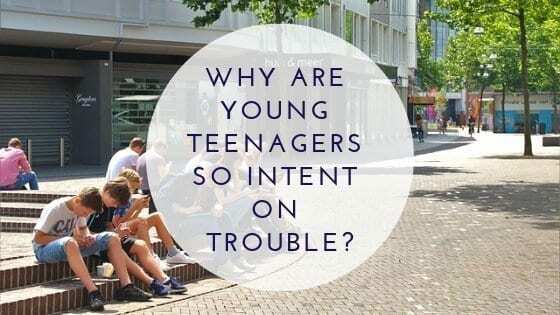 Home Lifestyle Why Are Young Teenagers So Intent On Trouble? After hearing of a friend’s teenage son being the victim of an attempted mugging the week before, I didn’t bat an eyelid as I prepared to venture into our local town late on Saturday afternoon. Why would I? I’m a 36 year old woman with a temperament that even The Hulk would be impressed by. Stupid teenage, scally gangs were certainly not going to stop me enjoying my time out. However, there was absolutely nothing that could have prepared me for the carnage that I viewed with my own eyes that day. Young teenagers with an utter disregard for anyone but themselves… and in some cases themselves due to sheer stupidity. Young teenage gangs fighting with each other. Young teenage gaggles looking for nothing more than to intimidate anyone in their sights for nothing more than shits and giggles and their own self gratification. Are you seeing a common denominator here? Young teenagers. 13-14 year olds. When I was that age, I did venture out into my local town with friends of a weekend. Happily catching the bus with my Clippercard (remember when the bus used to be 30p a journey?) and basking in my freedom and young independence. Saturday afternoon’s were utter bliss, involving shopping around Our Price for the latest Blur single… on cassette. Ogling the good looking guys working in Inter Sport. Scoffing Pick n Mix sweets we had bought in Woolworths. We were innocent, young teens, enjoying our time away from rules and simply enjoying life. I distinctly remember lots and lots of laughter. The young teens I observed on Saturday were not laughing, they were bitter, angry, rebellious, intent of mischief, miserable little arses! What has happened to the world when children, because that is what they still are, even as teenagers, are fearful of simply stepping out to the local bowling alley with friends for an afternoon of fun? What has happened that even adults feel uncomfortable to be in such areas which the aforementioned gangs frequent? When did it become a consideration on whether to visit before taking your family out for a treat? There have always been areas with such behaviour, even as I was growing up and I know my parents would have been disappointed if I had and something had happened. How do you stop your own area becoming one of ‘those’ areas though? Children are allowed their freedom so keeping them locked up until they are 21 is certainly not an option! As parents we can instil being vigilant, sticking to busier areas of the town, staying in the group of friends they are with and just generally keep their head’s down. It’s a sad state of affairs that we have to prepare our children that there ‘may-be’ trouble, life for young teenagers shouldn’t be like that. Adulthood is pants enough, they should just be enjoying their freedom and innocence! Liv is 10 years old now and I realise that she will want to visit our local town with friends of a weekend and it is already giving me sleepless nights! Thinking back, there were immense benefits to the boxing classes we took and as a parent, it is reassuring that she knows how to defend herself. Picking boxing back up has certainly been a consideration this week, the fitness benefits were fantastic! I am hoping things do improve, I am not holding my breath, but at least I still have time to fully prepare Liv for the teen years! What are your thoughts? Have you experienced similar behaviour? Do you let your young teenager(s) out of a weekend? I think disenchantment and boredom is inherent in the system. There is little for young people without an income to do and youth clubs closed down or open once or twice a week. They need to loiter somewhere and the mere fact they are in groups makes them feel intimidating. There will then be the bored and angry few who will behave badly and if they’ve nowhere else to focus their aggression it causes a nightmare for the entire community. As Mike Skinner so poignantly said “geezers need excitement. If their lives don’t provide it they stay, incite violence. Common sense, it’s simple common sense”. You need to give them somewhere to go and something affordable to do.